Maximum protection, without the bulk. The Elite Barrier Vest is the perfect spring, late evening summer or early fall riding accessory. It's from Elite Barrier fabric, a material that resists wind and water while remaining extremely lightweight and packable. Direct-Vent panels have also been added for additional ventilation at critical locations. 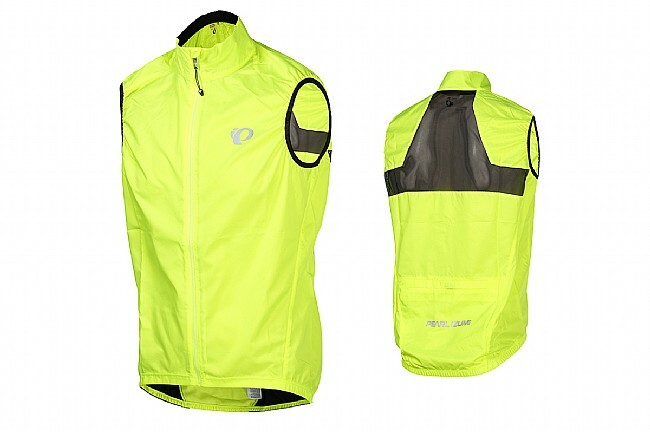 A full-length zipper with internal draft flap and zipper garage provide extra airflow when needed and seal out the elements on those chilly descents. Additional touches include an elastic waist and armholes for a secure fit, a single rear hook-and-loop pocket, and reflective elements for low-light visibility. The Elite Barrier Vest is available in various colors and features a semi-form fit. The Elite Barrier Vest works well for slightly chilly weather, as advertised. I found it to be perfect for mid 50s to mid 60s F. It has a good, snug fit. Not too tight, but not too loose either. Replaced an older version of the vest that finally wore out, and continue to be pleased with the fabric and fit. I wear it for commuting and find it has just the right amount of wind stopping without being crinkley. Fit is not racy but works well as a top layer. High vis color is really bright as well. the absolute only complaint is easy of access with bulky gloves to the pocket. If the pocket were a bit bigger wider, I don't think this would be as much of an issue.